This may look like bags for feet, what the heck, they are. It does have a fabric lining on the inside to enable the liquid, that you pour in, to be soaked throughly enabling the feet to be soaked all around. The liquid had a cooling sensation and it felt like wet socks, literally. There was a slight chemical scent, similar to acetone I’d say. There is alcohol and salicylic acid so if you’re sensitive to either of the two ingredients, don’t use it. I am able to tighten bags to make sure no liquid comes out but I still was cautious when I walked. The recommended soak in time is between 1 and 1.5 hours. At first, I thought the feet would soak the liquid fully therefore leaving it on for 2 hours instead. Once the 2 hours are over, the feet had to be cleaned thoroughly to remove the liquid then it’s the waiting game for the peeling. 3 days later, there were some sight of peeling on the bottom of my feet. From day 4, that’s when it got more interesting. The skin was peeling like crazy at the bottom of my feet as well as the top of my toes. It was messy and disgusting. They don’t recommend peeling the skin off, just to let come off naturally. In the end, I can see the dead skin in my socks. It was like the aftermath of sunburn without the pain. It was a painless procedure. This carried on for the next few days with the dead skin decreasing. I didn’t want to photograph this and upload it as it would probably put me off my food if I was reading this. There was no peeling on the top of of my feet. A week later, it seems that the peelings have stopped resulting in smooth, soft feet. Definitely an intensive exfoliation. Highly recommended. 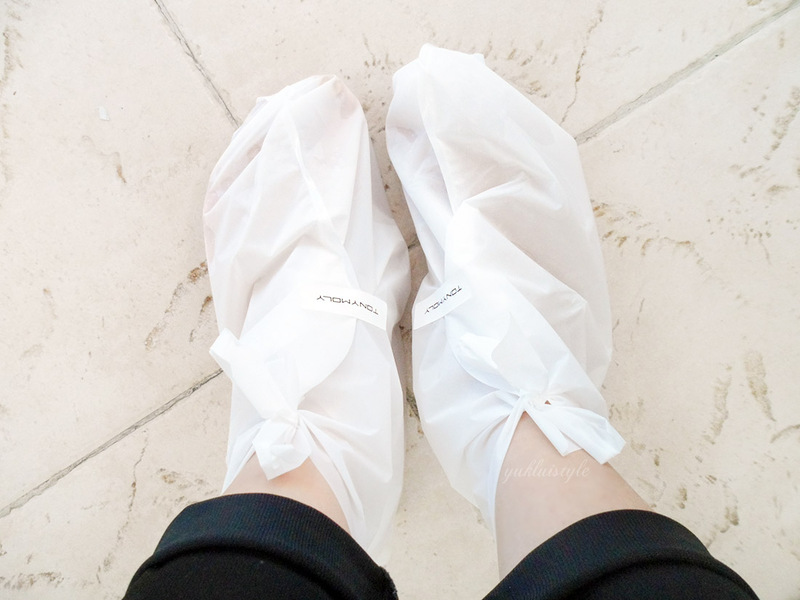 I would definitely do this once every month or whenever I need to prepare my feet for the summer which isn’t any time soon right now. As this is hard to get hold of in the UK, eBay would be the best bet to order. What are your thoughts on this foot peeling mask? This sounds so weird but like the results are pretty amazing! I've not tried anything like this so I'm super intrigued now!! That's cool, never tried one of these. But I am not sure about the peeling for a few days. I would probably be disgusted like you lol. But seems like it works well, so there's give and take! I've read a lot review about this product, will try this soon. Whao!! Off to the store to get one!! This product is just amazing!! You got my attention there! Anything to pamper my feet I'm in! This is a really interesting product. A must-have for summer. Sounds like such a great product. Should love to give it a try. i like all these mask but i dun like the process..my feet look so so ugly!! I would like to give it a try. Most of us don't pamper our feet as much as we should. Time to change it. Oh, looks so cool! Definitely something worth trying from Tony Moly. oh wow this is so good and I think it is very relaxing and useful too. Oh wow!! I really need to get my hands on this. My feet need some tough love and care! I used a product that does the same thing named Babyfoot! it's great! My boyfriend did this the other day and he's so excited about the peeling process lol I was a bit taken back at how expensive it was for just the one packet. But definitely seems like a good product to use for the upcoming Summer weather we have here in Australia!